No need to worry about what to wear to all your holiday events, because I've compiled a few outfit ideas to help you get through the season. From Turkey Day to the New Year, I have got you covered. Thanksgiving is a cozy holiday, so why not dress the part? For most, Thanksgiving dinner is a day spent at home, cooking (and eating!) turkey and watching football while chatting with the fam, so there's no need to get too extravagant with your look. A loose-fitting sweaterdress is comfy and warm but won't keep you from stuffing your face full of stuffing. Ankle boots are stylish but comfortable, adding a hint of trendiness to your look, and thin gold jewelry adds a bit of bling to your sweet look. The holidays are the perfect time to bust out the metallics! Nothing screams festive and fun more than replicating sparkling tinsel, so mix and match different metallics and jacquards for your next wintertime dinner party. If you're a more casual dresser, an embellished sweatshirt and a sparkling midi will work wonders. If you love being the life of the party, a flirty metallic mini and animal-print accessories will make sure all eyes are on you! No matter what, everyone will be striking up dinner conversation over your fabulous outfit. If you find yourself attending a black tie event this holiday season, good for you, and why not go all out with a bold statement? 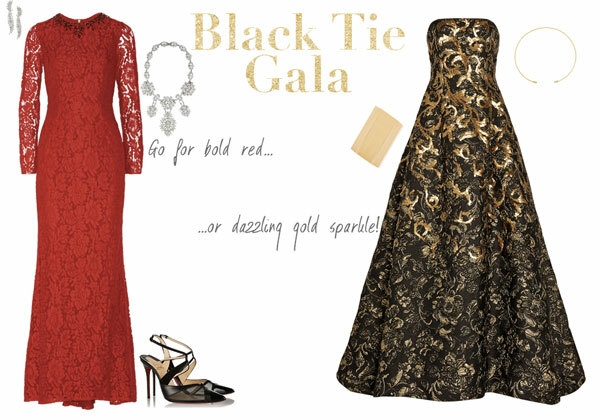 Whether it's a festive holiday red or a dazzling ballgown embellished with gold details, don't be afraid to go all out and shine! Check back later for more outfit ideas, and party on!